Being the youngest tool isn’t easy. No one listens to Nick, and everyone says he’s dull. But when a fire erupts on the farm, only the brave little saw springs into action. Soon they’ll be calling Nick a hero — and the sharpest tool in the shed! Nick the saw has a hard time impressing his fellow tools until he shows them how to be a hero. The story’s great fun and the wordplay will be enjoyable for kids (and the adults who will read it to kids). The other tools are named after celebrities (such as Mini Screwdriver), exemplifying the wit and humor of the book. This story will have kids fixin’ to smile. The word play in this book is delightful. 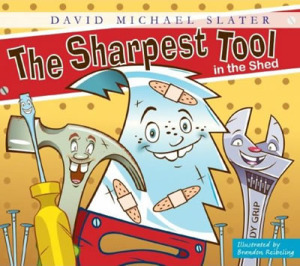 A hammer named Mike, a pick named Tracey, and a hoe, named Don are just some of the tools in this book. In addition to the fun names, there are fun puns as well. But there is also a more serious side to the book. Mr. Slater is a teacher and has produced a book that will help children to discuss feelings of not being accepted by their peers. It would be an excellent book for elementary school children as a conversation starter on this very important topic. This book is a surefire winner for parents who read to their children for both entertainment and instruction. It is filled with delightful puns and word play for sharpening little minds or just enjoying the whimsy of English.